(1) The official languages are Hindi and English. (2) The city is surrounded by hills on three sides, and sand dunes on the fourth. (3) You’ll find many different temples here, the most famous being the Brahma Temple. As you may have now guessed, Pushkar is a city located in India. To be precise, it is located in a valley that is close to Ajmer, in the north Indian state of Rajasthan. The most ideal time to visit Pushkar is between October and March, while avoiding the summer months. This is because summers in Pushkar are notoriously steamy, sometimes reaching a high temperature of 114 degrees F.
One of the things for which Pushkar is best known is its significance within the Hindu religion. The city is among the five dhams, or pilgrimages, that are held in high esteem by the Hindus. The other four include Badrinath, Puri, Rameswaram, and Dwarka. 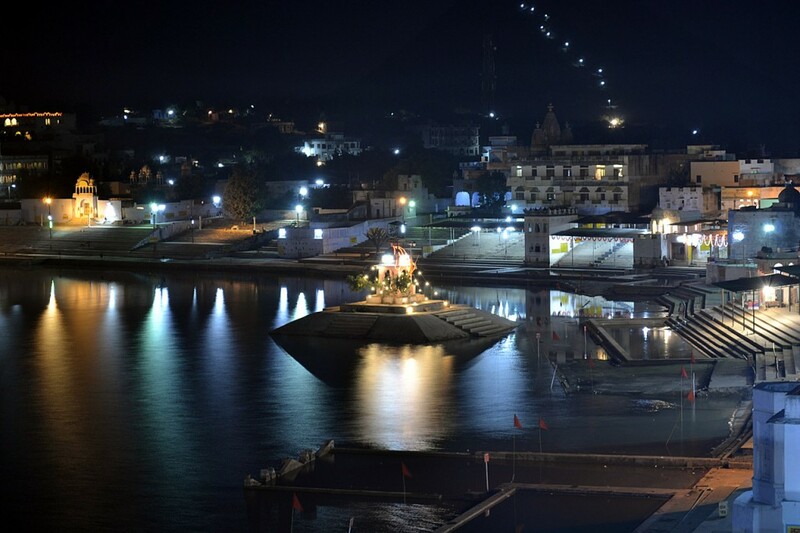 According to legend, Pushkar Lake was at one point surrounded by 500 different temples, and 52 palaces. Several rajas and maharajas maintained palaces here for their annual religious pilgrimages. Today, Pushkar is known as “The City of Temples,” as 400 different temples still stand. The most important and well known temple is the Brahma temple, which is actually the only one of its kind in all of India. You can identify it from afar by its distinctive red spire, and the image of a hans (the goose considered sacred to Lord Brahma). Built in marble, the temple is decorated with silver coins and colorful banners, and contains an image of a silver turtle on its floor. An interesting fact regarding Brahma is that he is not actually worshipped within Hinduism, even though he is part of the Holy Trinity of the religion. The other two that make up the trinity are Vishnu and Shiva. Brahma is considered to be the creator, Vishnu is the preserver, and Shiva is the destroyer, (although a sympathetic destroyer in that things must be destroyed in order to allow for renewal and rebirth). These three figures of the Holy Trinity are considered to be manifestations of one great God. Another important temple within Pushkar is the temple of Goddess Savitri, the wife of Brahma. It is located on a hilltop, and may be reached after completing a one-hour uphill journey on a long flight of stairs. It is entirely worth it, though, as the temple has a gorgeous view of Lake Pushkar with its surrounding sand dunes, and the landscape dotted with other temples. It is a view that is particularly beautiful in the morning. In addition to being famous for its many gorgeous temples, Pushkar is also well known as the home of the annual Camel Fair. The Camel Fair takes place each November, and attracts up to 300,000 visitors, as well as up to 20,000 camels. During the ten day festival and tribal gathering, herders and traders travel from the desert and set up camps in and around Pushkar. For some of the travelers, the journey to the city may have taken a full 3 weeks. Over the ten day period, horses, camels, and other livestock may be bought, sold, and traded. It is amazing scene that, for tourists, is both a colorful display of humanity and a cultural lesson. You may even see marriages being traditionally arranged.